Choice of departure is up to the visitor either Grenada or Carriacou. The connection is either by ferry or airplane between the islands and must be booked by the client. St. Vincent, Palm Island, Petit St. Vincent, Sandy Island. The accommodation will be in two doubles for adults and up to two children can be accommodated in the livingroom. Children must be minimum 6 years old. 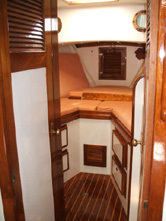 The skipper will be sleeping either in the living/double room or outside on deck. Generally is no experience needed but you will be welcome to learn from the 17 years experience of the skipper. The shower is on deck what completes the adventure. It will be advisable to bring a bag instead of a big suitcase. A small suitcase for hand luggage will be fitting into the cub board. Please be advised that inside the vessel is no smoking allowed. You will be able to use the swim deck to smoke. There will be only 110 volt up to 3000 watt. In case you need 220 volt to load your cell phone or video/photo camera – there is an adapter on board. The boat is 11.80 meter long and approximately 3.60 meter wide. The draft of the Boat is 2 meters. Inclusive: Skipper, Food depends on booking. To pay at destination: Check In and Out, Customs and Immigration, Marina or Mooring Fees, private costs like alcoholic Beverages and restaurant and bar visits. Children policy: 50% up to 12 years. Reservation policy: Down payment of 30% to confirm booking. Balance due 60 days prior arrival. AD Travel LTD and partner are not liable for any changes in the excursions or cancellation of tours before the start of tour due to force majeure, e.g. bad weather etc. We reserve the right to alter excursions at any time. Copyright © 2007 AD Travel LTD.